Relieves pain. Bacteriostatic. Cools and soothes minor burns, sunburns, scalds, and abrasions. 1/8 oz. each. Relieves pain of minor burns, sunburn, scalds, and abrasions. Provides a disinfecting action. Safetec First Aid Burn Gel Foil Pack - 32 oz. For temporary pain relief of minor burns. 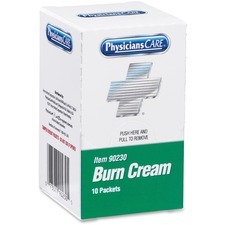 Recommended for the temporary relief of minor burns. Cools and soothes damaged skin without trapping heat and dries without leaving skin feeling sticky.